The project is located at the “La Tate” neighborhood in Divonne-les-Bains (01220) at the entrance to the town. The site is situated close to the Jura Mountains Regional National Park and 15 kilometers from Geneva. Divonne-les-Bains is home to 8,400 inhabitants of 90 different nationalities. It is a tourist and spa centre offering a wide range of possibilities for practicing different leisure activities. This is a development comprised of 55 luxury apartments separated in 4 buildings. Each building is set in the heart of an intimate island among lush greenery and landscaped gardens with a variety of species, diverse partition hedges, and alleys. The apartments ranging from T2 to T5, using the French size codes – T2: 1 room, T3: 2 rooms, T4: 3 rooms, T5: 4 rooms. The sizes of the apartments are approximately T2 = 50 sq.m, T3 = 80 sq.m, T4=105 sq.m, T5 = 135 sq.m. The apartments will be heated by a gas-fired boiler, and are fitted with outside joinery in wood and aluminum. The facades will be made using Jura stone on the lower areas of the buildings and parapets will be in frosted glass or lacquered aluminum/steel. The apartments will be fitted with 45 x 45 tiling in kitchens and living rooms. Particular attention has been paid to the terraces and balconies (these feature in each apartment). All the apartments at garden level have a vast terrace along with an unusually spacious private lawn area with hedge enclosures. The balconies on the upper levels, which are sheltered from inclement weather, serve as genuine living quarters from the spring to the autumn. They are exceptionally big and boast high-grade finishes. Project architecture is in harmony with nature. 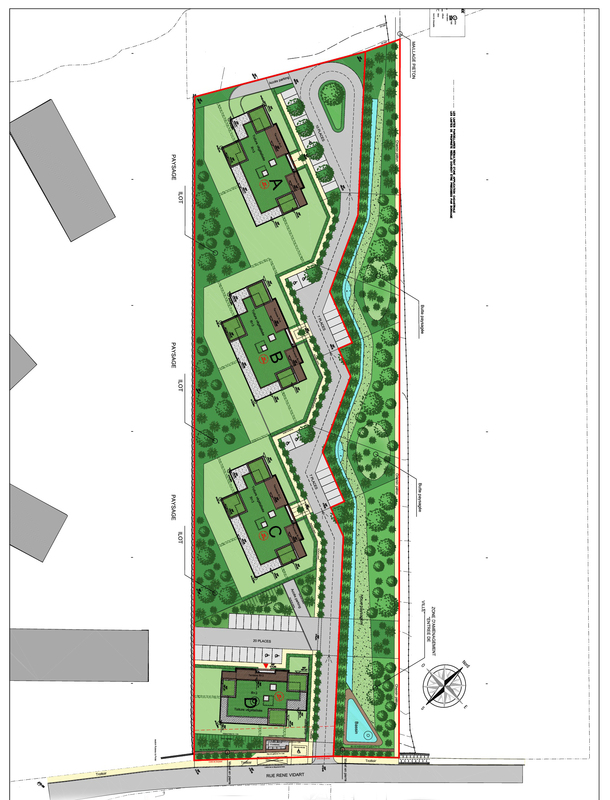 Landscaped waterbed will be incorporated into the residence, which will mark the entry into the town. All the apartments will benefit from underground parking spaces. The structure will be made in shuttered reinforced concrete, concrete aggregate, brick or cellular concrete depending on the concrete engineer’s study and the opinion of the control office. Concrete terrace roofing including thermal insulation, sealing and protection by “greening”. Thermal insulation will be calculated so as to comply with RT2012 thermal requirements. Waterproofing for accessible terraces with a finish in wood-slat or composite material decking depending on the architect’s choice. Waterproofing for non-accessible terraces on the top floor, with surface protection by “Ecocebum” or “Sopranature” ecological systems or by another equivalent technique for regulating rainwater drainage systems. Thickness of insulation as per the thermal study made by the thermal design office. The main facades will be with a mineral sanded finish on concrete walls insulated from the outside (and with extra interior insulation if required by the thermal study). Decorative elements in concrete (overhangs, cornices, parapets and concrete soffits) will be treated with top-quality outside paint-work. Certain facades may be covered in Jura stone, terracotta panels or laminated panels depending on the architect’s choice. Heating and back-up for producing hot water will be provided from a collective boiler room, equipped with a extra-high performance condensing boiler running on natural gas. The heating system will be regulated depending on outside temperatures. Heating pipes will be in a shaft placed on the landings with individual energy sub-meters for calculating the consumption ratio between co-owners. Heating will be distributed by low-temperature under-floor heating supplied from manifolds in each apartment. The main rooms will be fitted with ambiance thermostats for adjusting the temperature as per recommendations of the thermal design office. A towel drying radiator is provided in shower and bathrooms as per plans. Fresh air vents in main rooms and foul air extractors in kitchens, WC, showers and bath-rooms. Hot and cold water piping will be in copper, PER or multilayer material, apparent and/or incorporated in the concrete floor-slab, whose diameters will vary as per the study made by the fluid engineer. A general supply and distribution feeder will be located in each apartment as per the study made by the fluid engineer. Waste water will be drained via PVC piping, either apparent or incorporated in the technical shafts with diameters to be set depending on the fluid engineer’s study. A tap for watering is provided on ground-floor and roof-top terraces. All items of sanitary equipment will be white and equipped with combination fittings on baths, thermostatic fittings on showers, and single lever taps on washbasins. - 170 x 70 cm bath with hand-shower and bath-screen as per the architect’s plans. - Wall-hung WC unit, push-mechanism and double rigid seat, 3l/6l water saving device. - Washbasin unit complete with basin surface topped by a mirror and lighting as per the architect’s plans. - Acrylic shower tray (dimensions as per plans) and shower-screen with dimensions as per the architect’s plans. Hand-shower on the right of WC. Windows or French windows open either inwards or are sliding as per plans. Outdoor joinery and openings are in wood on the inside and aluminum on the outside. Insulating double glazing as per recommendations made in the thermal study. Power-driven roller-blinds on all apartment bay windows (centralization on option), except on bathroom, WC and larder windows as per the architect’s plans. Balcony or terrace parapets in steel or thermo-lacquered aluminum ironwork in colors to be decided by the architect, with frosted glass panels or bars as per the architect’s façade plans. Externally insulated walls as per the recommendations of the thermal design office. Interior partitions in apartments will be of the plasterboard type fitted on a metal framework together with mineral wool insulation. Total thickness of partitions 73 mm. Enclosures for mechanical ventilation metal ducting, water supply piping, sewage and waste-water discharge will be constructed in compliance with regulations on acoustics. Door and window frames will receive two coats of paint. Smooth-surface white paint on inside floors and ceilings of all rooms in apartments (“hydro” type in washrooms) with mat or gloss finish depending on their location. With lawns and separating hedge + chain-link fence and gate. Loggia facades covered in terracotta, stratified panels or sanded finish as per the architect’s plans. Access control by video-intercom and “Vigik” system at the entrance to each building. The lift will go to all the floors in the building. The cabin will be decorated as decided by the architect. Spray painting on walls and ceilings. Passageways automatically lit by means of presence detectors. Main access door to the basement in metal with remote opening/closing by transmitter system (2 transmitters per parking space). Power-driven overhead door, one lighting point and one power socket. Wall, floor, and ceilling untretead. One lighting point and one power socket. Alveolar painting door.